It's a simple idea. When an asset falls further than people expect – for longer than people think is possible – they give up on it. It becomes a "left for dead" asset. And investors want nothing to do with it. For example, I urged readers to buy stocks in March 2009, when nobody wanted to be in the markets. Buying stocks at that moment of extreme pessimism was the right call... The stock market is up more than 300% since then. The market peaked a few years earlier and had fallen – fast. We reached the moment of extreme pessimism in housing. But in hindsight, that moment was a perfect opportunity to buy. Today, we have another extreme in pessimism... This time, it's in precious metals. And it could mean we have triple-digit upside ahead of us. The story is the same as it always is... Precious metals have fallen further than people expected, over a longer period of time than they expected. Silver hit $35 an ounce a few times in 2012. Today, as I write, it's around $14 an ounce. As you might guess, after such a big fall and so much time, investors have completely given up on silver. 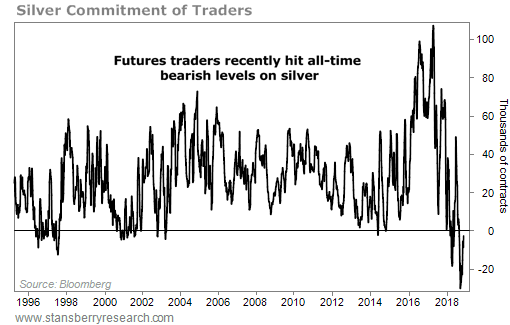 Futures traders are now the most bearish they've ever been on silver. That's why today's opportunity could mean triple-digit upside once this extreme reverses. If you're familiar with my work on sentiment indicators, you know we often look at the Commitment of Traders (COT) report. It's a weekly report that tells us exactly what futures traders are doing with REAL money. It's not a survey... It doesn't focus on opinions, which can be biased or unreliable. These traders are putting actual money to work. The simple story is that futures traders often get it wrong at extremes. When traders all bet in one direction, the opposite is likely to occur. You can see this moment of extreme pessimism. Futures traders are all betting on lower silver prices today. Specifically, silver soared more than 70% from mid-1997 to early 1998. After hitting another negative sentiment reading in 2002, the metal soared more than 250% by 2008. And it rallied more than 30% after a similar case in late 2014. The problem for me is the uptrend... We don't have one. Hated markets like silver can still get more hated. You don't want to try to catch a falling knife. It's not time to buy – yet. But I believe the time is coming soon. Not only that, but we're starting from a point of extreme pessimism. That means triple-digit gains are possible in silver when the bull market in precious metals finally kicks in. We are getting close. When the time comes, you want to take advantage of it. Regular readers know Steve and his team use the COT report to find extremes in all kinds of assets. Chris Igou recently described how a recent sentiment reading is warning us away from one area of the market today... Read more here. "The trend is in favor of this precious metal," Steve writes. "And given how misunderstood it is by most investors, prices could soar much higher from here." Learn more about another bullish setup in the commodities market right here: This Metal Will Soon Be More Precious Than Gold. 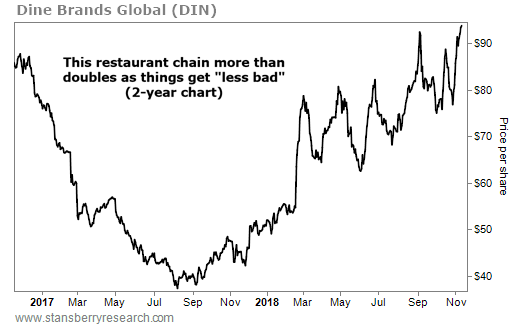 Dine Brands Global (DIN) is one of the world’s largest full-service restaurant companies. Between its IHOP and Applebee’s brands, it has about 3,700 locations in 18 different countries. Dine Brands’ annual sales started to fall in 2015. Facing competition from the fast-casual market, the company upped its delivery game and reached out to a younger audience… Now, sales and earnings for the latest quarter have topped analysts’ estimates. Plus, the company raised its full-year profit outlook.